On October 19, 2018, the Metropolitan Planning Council brought together more than 100 business leaders, transit providers and public officials to identify a path toward a more transit-rich and transit-supportive region. Our Transit Means Business event concluded with small group discussions around the following two key questions: How do we lay the groundwork for sustainable, dedicated transit funding, and how do we get employers and workers to be more transit-oriented? The main takeaway: Improved education for a wide range of stakeholders is needed. Below are the issues discussed and future actions for stakeholders in the state and region to take. A key focus of discussion was on how the general public has little understanding of the regional transit system’s very precarious funding state. Transit riders know about some maintenance issues because they experience the delays and inconveniences associated with a system that’s not in a state of good repair. However, there is a lack of understanding that fare revenue does not fund maintenance, repair or system upgrades. Riders see fare increases, but no improvement in service. Among the non-riding public, there is virtually no awareness of the funding plight, or the impact that transit has on everyone, including drivers. 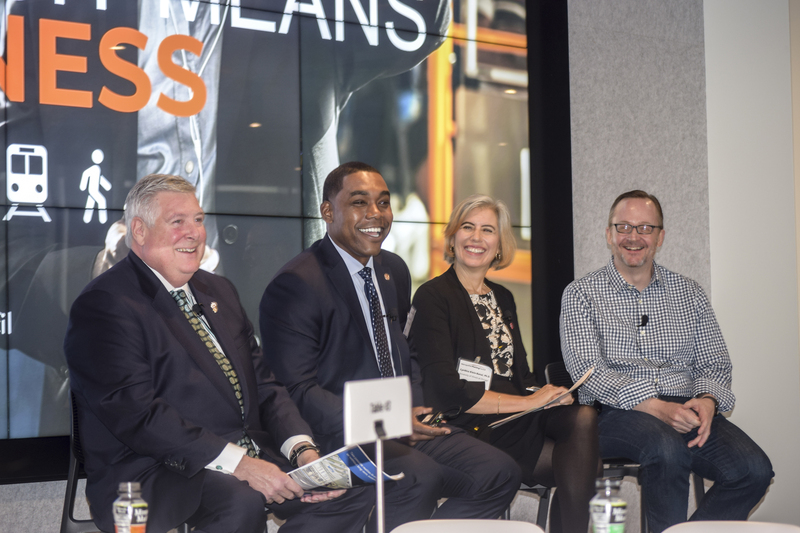 Even many top-level business executives in attendance acknowledged their limited understanding of how transit service helps to recruit and retain an effective workforce. Furthermore, despite the trend in office real estate toward transit-oriented locations, many businesses still see transit as an amenity rather than a necessity. Companies understand that the availability of transportation options beyond driving is important, but most don’t feel like they have a direct role in making those other modes more feasible for workers to use. Critically, legislators and their staff who attended the event said they aren’t hearing from their transit-riding constituents about the travel issues they’re experiencing and how delays or unreliability is affecting their lives. Road users are much more affluent, organized and engaged in local and state politics, while many transit riders have fewer resources, multiple jobs and less time to dedicate to advocacy work. This is perhaps another symptom of the lack of information on how public transit is managed and funded. Educate the public about funding sources for transit, what fares pay for, and needed investments. Educate on the challenges of transit farebox recovery ratio requirements—the proportion of operating costs that are covered by fare revenues paid by passengers, which is mandated at 50% for the RTA service area, and how no similar provision is required for roads. Educate business executives about transit funding and system conditions. Boost communications to legislators by constituents and businesses about the critical need for improved transit performance, increased service, and expanded coverage. Issue: Workplaces need to be more transit-supportive. Participants generated many ideas about how employers can reduce barriers to transit ridership for their employees, ranging from revenue-neutral options to full-scale transit subsidies. On the low end, they can be more flexible with work schedules and count transit travel as work time when work is done while riding. Businesses can participate in transit benefits programs that take only a small amount of administrative set-up. They can provide more information to their employees on transit options to work. A stronger incentive is for employers to subsidize transit usage long term, or at least for a trial period to give employees an opportunity to try it out. A longer-term solution is to have more businesses participating in Transportation Management Associations, where companies collaborate to fund first- and last-mile solutions that can broaden the reach of the region’s fixed-route transit. Real estate professionals and building owners now aggressively market proximity to transit, which represents a welcome shift from an emphasis on parking during past decades. Beyond locating near transit, the notion of employers being involved in their employees’ commute is still relatively novel in this region. Transit benefits that do exist are often underutilized and poorly understood. The cost of setting up new incentive programs is also seen as a barrier, although it may be much lower than expected. Human resources departments are key, and employees must play a more active role in advocating for better transit benefits and more involvement from management. Educate businesses—specifically HR staff—on how transit access is key to attracting and retaining talent. Educate businesses on the cost savings of owning/managing less parking by shifting more commutes to transit. Educate businesses on how to realistically estimate demand for parking (usually they overestimate). Educate on the many regional benefits that transit provides, even to non-riders, including: improved safety, better public health for active transportation users, improved air quality, reduced GHG emissions addresses climate change; reduced congestion/demand for highways, etc. Providing for pre-tax transit fare payment in HR benefits systems. Encouraging flexible schedules that will reduce the crush of riders during peak commute periods. Providing more information to employees on transit commute options as part of the on-boarding process. Initiating programs for employers to subsidize transit usage for new employees either for a trial period as an opportunity to learn how to use transit, or as an ongoing benefit. Transit subsidies are often relatively inexpensive when compared with employee compensation and benefits. Providing a cash payout to workers who do not use employer-provided parking. Allowing productive time riding transit to be counted as work time. Establish and participate in Transportation Management Associations, whereby multiple employers collectively finance last-mile solutions such as shuttle buses to Metra or CTA stations. Advance state or regional legislation to require employers over a certain size to offer pre-tax transit benefits. San Francisco, New York and Washington, D.C. all have such ordinances. Advance local legislation to require employers over a certain size who pay for their employees’ parking to offer parking cash out to those who do not drive. Participants also identified many barriers to transit ridership in the region, especially in suburban areas, which will require proactive work to overcome. For many suburban businesses, locating near transit is the first choice, but transit-oriented locations are limited. Many companies believe that free parking must be provided to be competitive. Low density, auto-oriented land use patterns with poor pedestrian connections result in infrequent and inconvenient transit service. Incremental changes and long-term capital investments can overcome these problems, but businesses make real estate decisions on a much shorter timeline. Improved innovation can also accelerate the pace of change in our region. Developing incentive programs and employer-supported transit options requires creativity and a willingness to experiment. 1Educate regional land use decision-makers, in the suburbs as well as the city, to ensure transit-supportiveness is maximized for new developments. Promote RTA’s Transit Works Guide, Pace’s Transit-Supportive Guidelines and CTA’s Transit Friendly Development Guide. Work with developers to encourage best practices in how to make new developments maximally transit-supportive. Develop of new transit fare media programs for distribution via employers such as the Orca Business Passport in Seattle or the RTD Ecopass in Denver, resulting in transit discounts for employees when fare media are purchased in bulk. Address community safety issues in transit station and bus stop areas so people feel comfortable walking to and waiting for transit. Add and improve sidewalks to make transit stations/stops easier to access. Promote RTA’s Making Way to Access Transit guide. Identify urban and suburban corridors and travel markets in need of more frequent transit service or longer service hours, and develop strategies to fund increased transit service. Leverage Transportation Network Companies, i.e., Lyft and Uber to address last-mile access in areas or at times when transit service is unavailable. Much like the general public, many legislators are also unaware of transit’s maintenance needs, and even lack a full understanding of how transit is funded. In addition to that foundational knowledge, legislators also need to understand the impact of transit service on business location decisions and access to jobs. Job creation is the highest priority of most lawmakers, followed by economic development and quality of life issues for their constituents – transit can be a key solution in all of these areas. Encourage residents and businesses to tell legislators about their transportation needs and how transportation issues are affecting their lives. Encourage local businesses to meet with legislators to tell their stories of how transportation is affecting business success, access to talent and employees’ quality of life. Employers may need to better understand employees’ commute patterns and transportation challenges, potentially through conducting employee surveys. Highlight for legislators how transit benefits workers throughout the income spectrum – it is critical for lower wage workers to reduce the economic burden of car ownership, and also a major consideration for higher wage workers for whom a range of transportation choices is key to economic competitiveness. Encourage legislators to support an increase in sustainable transportation revenue with a significant share for transit. Encourage policymakers to implement more aggressive incentives for supporting and using sustainable forms of transportation including transit so the region’s transportation profile becomes more sustainable in terms of overall mobility and sound environmental practices. Address the need to improve trust in Illinois government, which is key to securing adequate transit funding. Highlight how key ingredients for this transformation are already in place: worthy transit projects and policies have been identified (RTA Invest in Transit Plan, CMAP On To 2050 plan) and there will be transparency in how investment decisions are made.